PRAYER PROMPT ••• There are some words that are used so frequently, their meaning gets watered down from overuse. We love our spouses, but we also love pizza and ice cream. In the church, there are a few watered down terms as well. This morning, as I read Psalm 136, the phrase, “His faithful love endures forever” was repeated 26 times. We speak of faith often (a noun meaning trust, confidence, and belief). It’s a key ingredient in… well, in our faith. But “faithful” is an adjective. Both are heavily used terms in the church, but how often do you stop to absorb their meaning? God is the very definition of faith! Of course, that kind of ongoing loyalty gives a powerful description for His love! As our Creator, God hasn’t abandoned us, even when we’ve disobeyed and even abandoned Him. His love is a reflection of that promise. Given that God was willing to send His son to die for us, that’s a solid example of His love’s strong assurance! There is only one, true God (1 Timothy 2:5). He has no beginning and He has no ending (Revelation 1:8). He IS the one and only original and moreover, God IS love (1 John 4:8). 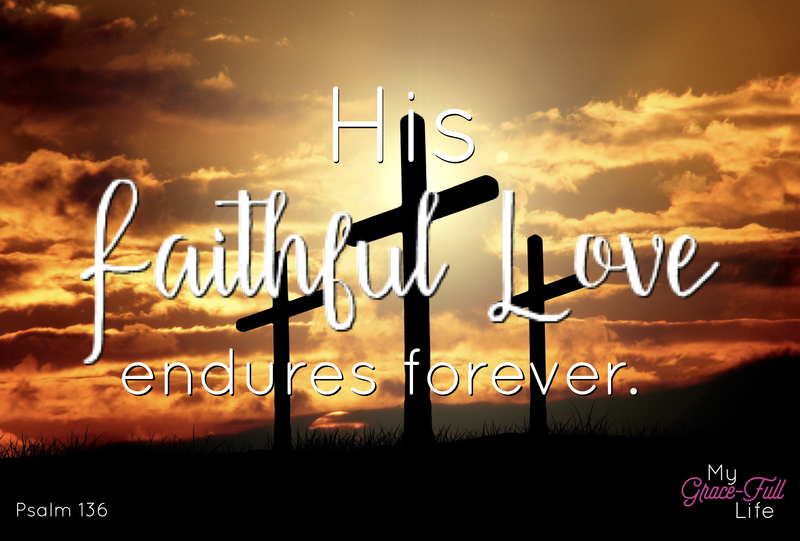 With all that said, and a brief study on the term “faithful,” it’s no wonder the Psalmist chose to repeat the phrase, “His faithful love endures forever” 26 times! Today, as you pray, thank God for being faithful! Thank Him for His faithful love and all that it means! Ask Him to help you exemplify His faithful love to others wherever you go today.